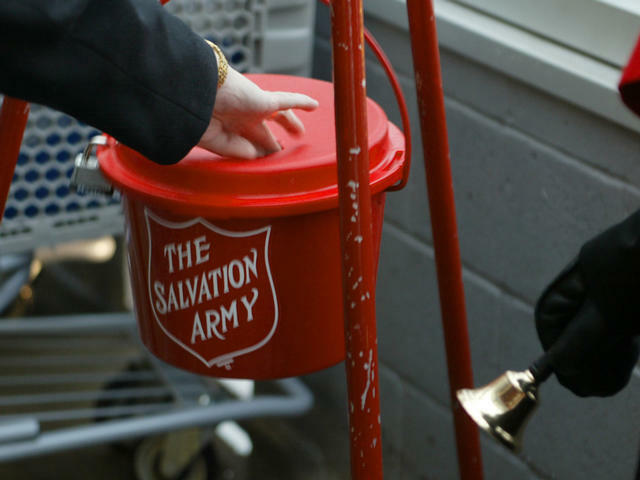 ALEXANDRIA, Va., March 7, 2018 /PRNewswire/ -- The Salvation Army's iconic Red Kettle Campaign collected $144.5 million in 2017 thanks to the support of donors and corporate partners. The money raised will help The Salvation Army provide food, shelter and social services to nearly 25 million Americans in need this year. "The country faced many hardships last year after multiple natural disasters, making 2017 an even more important year for giving," said Lt. Col. Ward Matthews, community relations and development secretary for The Salvation Army's National Headquarters. "We're humbled by the generosity that will allow The Salvation Army to continue serving America's most vulnerable populations in 2018." In addition to the $144.5 million raised in red kettles and through corporate partners, online donations through salvationarmyusa.org totaled $45.4 million, a 26% increase over 2016. The Salvation Army began the season by issuing a call for action, asking Americans to join the Fight for Good, the official theme of the 2017 Red Kettle Campaign. Joined by a few notable citizen soldiers who each chose their own battle in the Fight for Good, The Salvation Army rallied supporters to designate their contributions to support cause areas that fight hunger, provide shelter or ensure Christmas assistance for those in need. Trick-shot artist and YouTube phenomenon Brodie Smith hosted a fundraiser to fight for hunger relief and teamed up with professional skateboarder Tony Hawk to raise awareness of the need for donations this holiday with a Red Kettle skateboarding trick-shots video. Olympic hurdler Lolo Jones fought to keep families safe and warm during the holidays with a fundraiser dedicated to sheltering the homeless. When she was a child, Lolo and her family benefited from The Salvation Army's shelter programs, and she made a special appearance on the show Steve to talk about what it means to help others during the holidays. Author and social-good ambassador Chris Strub, who was the first person to livestream from all 50 states, called attention to the many faces and challenges of poverty as he chronicled his 25-state #FightForGoodTour on his social media platforms and YouTube channel. Jerry Jones, Charlotte Jones Anderson and Red Kettle Kickoff performer Thomas Rhett, along with Commissioner David Hudson, The Salvation Army's new national commander, kicked off the 2017 Red Kettle Campaign with a satellite media tour at AT&T Stadium the day before Thanksgiving. The Dallas Cowboys also showcased #FightForGood on national television just before Thomas Rhett's LIVE halftime performance. The campaign kickoff marked the 21st year the Cowboys organization has partnered with The Salvation Army to launch the iconic campaign during the nationally televised game. Since partnering with the team, the Red Kettle Campaign has raised more than $2.4 billion. Leading up to and on #GivingTuesday, Nov. 28, The Salvation Army was seen and talked about during national media appearances on The Today Show with Tony Hawk, Access, Access Live, Buzzfeed's AM to DM, WGN Radio, Mornings with Maria and Steve. The week of Christmas, The Today Show aired a segment featuring The Salvation Army's Door of Hope program in San Diego, Calif.
Corporate partners also contributed greatly to the success of the 2017 Red Kettle Campaign. Red kettles outside of 6,400 Walmart and Sam's Club locations across the U.S. collected $43.3 million, which contributed about 30 percent of the $144.5 million total. The Kroger Co. hosted Red Kettles at more than 2,700 locations across the country, raising a total of $18.2 million, or about 13 percent of the $144.5 million total. Red kettles at roughly 770 JCPenney stores collected a total of nearly $2.3 million for the campaign, 1,718 Walgreens locations raised $2.5 million, 600 Big Lots locations raised $905,000 and 68 Bass Pro Shops locations raised nearly $440,000. Hanes and The Salvation Army teamed up once again to provide socks to those in need. As part of their annual sock drive, Hanes donated 75,000 pairs of socks to The Salvation Army, bringing the total number of socks donated over the past nine years to more than 2.4 million pairs. Between Nov. 1 and Dec. 31, Dr Pepper Snapple Group donated a portion of sales to The Salvation Army for every specially marked 7UP, Canada Dry and Squirt two-liter bottle, 20-ounce bottle and 12-pack sold. Calling on snackers to not only give thanks during the holiday season, but to give back, Frito-Lay North America donated to The Salvation Army with every bag sold of its new Tostitos Yellow Corn Bite Size tortilla chips. Donations totaled $300,000. UPS ran its Wishes Delivered campaign and included The Salvation Army in its select group of charity partners to each receive $33,000. For every wish submitted with the campaign's hashtag, UPS donated $1 and shared stories of the people and organizations who are solving problems to make a difference in communities. During the holidays, more than three million people rely on The Salvation Army to provide them with warm meals or toys for their children on Christmas Day. Donations made to the red kettles help The Army provide more than 10 million nights of shelter and 56 million meals a year, along with substance abuse recovery programs, after-school programs and emergency shelters for children and families in need. In all, The Salvation Army is able to help nearly 25 million people each year, thanks in large part to people's generous donations. The Salvation Army, established in London in 1865, has been supporting those in need without discrimination for more than 135 years in the U.S. Nearly 25 million Americans receive assistance from The Salvation Army each year through a range of social services: food for the hungry, relief for disaster survivors, assistance for the disabled, outreach to the elderly and ill, clothing and shelter for the homeless and opportunities for underprivileged children. For every dollar donated to The Salvation Army, 82 cents is used to support those services in 5,000 communities nationwide. The Salvation Army tracks the level of need across the country with the Human Needs Index (HumanNeedsIndex.org). For more information, go to salvationarmyusa.org or follow on Twitter @SalvationArmyUS.